In a consumer-driven and technologized world, can we still experience the mystery of God? This book answers yes by exploring the rich resources of the Christian tradition of thinking and speaking about God. Focusing on God's dialectical character-divine availability ("presence") and divine excess ("absence")-and the belief that "God is love" (1 John 4:16), professor Anthony J. Godzieba tracks how God became a problem in Western culture, then responds by showing how human experience is open to divine transcendence and how that openness encounters the revelation of God as Trinity. The book's contemporary edge comes from its insistence that belief as embodied performance is the most authentic way to participate in the mystery of God's love, which is "the answer to the mystery of the world and human beings" (Walter Kasper). Anthony J. Godzieba is professor of theology and religious studies at Villanova University and former editor of Horizons: The Journal of the College Theology Society. His work in systematic, foundational, and philosophical theologies is published widely in various collections and in journals such as Theological Studies, Louvain Studies, and The Heythrop Journal. Most recently he has co-edited (with Bradford Hinze) Beyond Dogmatism and Innocence: Hermeneutics, Critique, and Catholic Theology (Liturgical Press, 2017). "We can rightly compare this God-book with an excellent bottle of wine from a renowned vineyard which has been gracefully aged in time-tested barrels, and now is presented to today's readers to drink. Like such a wine, it possesses a rich flavor and fresh aftertaste which lingers after we have finished drinking from it. Experience and tradition, faith and reason, reflection and imagination, ineffability and incarnation come here wonderfully together in one book which amounts to a presentation of the mystery of God's love, reflected upon, imagined and witnessed to for our days. It is to be highly recommended to connoisseurs of fine theological wines." "I highly recommend this book as an intensely practical way to access the mystery of God's salvific love." "Anthony Godzieba's new book is a fascinating and informative passage through the main questions of Christian theology. It integrates a profound historical view on dogmatic theology, deep spirituality, and innovative theological concepts into contemporary research on God. Assessing the questions posed by the modern critique of religion, it offers convincing arguments on why we should neither cease to consider God as an essential topic of science nor as a possible dimension in our everyday lives." "This book explores perennial questions and contemporary conundrums about knowing God. Considering venerable answers to these questions and their critics launches this endeavor. In conversation with the contribution of Walter Kasper at the crossroads of the heritage of natural theology and the confession of faith in the Triune God, this work navigates through postmodern frontiers and pioneers an aesthetic and performance approach to the encounter with the God of Jesus Christ that illuminates paths for Christian discipleship on pilgrimage in the world. An important achievement." "Clear, very well informed, and admirably argued, this book shows how, after all the changes in Western thought, we are still justified in holding that God is simultaneously present (available and knowable) and absent (mysterious and uncontrollable). God's love answers the deepest human longings. This work is a splendid example of authentic natural theology." "A capstone achievement that harvests years of theological research and teaching, Anthony Godzieba masterfully illustrates what a phenomenological study of God should do. This brilliant new book gives attention to relevant biblical passages, significant philosophical positions, noteworthy works of art, and major contributions of contemporary theologians in a `student-friendly' way." "A theological masterpiece! In deeply learned and highly readable prose, with Walter Kasper leading the way, Godzieba follows the traditional ways of negation and eminence down modern and postmodern paths of construction and critique. While giving natural theology its due, he deftly works the dialectic between God's incomprehensible mystery and simultaneous presence into a genuinely theological theology. If these two approaches to God as present and absent don't exactly lie down together, they come to as much peace as we might expect in our times. This book bears many signs of Godzieba's long career in the classroom. 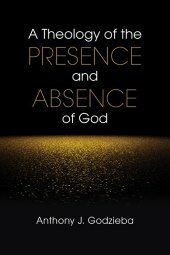 If you have been waiting for a God book for your graduate course, A Theology of the Presence and Absence of God is it." "A theological gem. Godzieba engages the biblical and theological tradition, as well as contemporary theology, in a way that is easily understandable and illuminating. He also takes on the challenge of God's presence and absence in a way that is creative and original. It is a must-read for any Christian facing the mystery of God, and experiencing both the absence and presence of God in a time and in the world where God seems both near and far. The book will serve as a great introduction for courses on God."